​Why should you use the SunLight System ? It has been scientifically proven by many studies that the human metabolism is influenced by the change of the light spectrum of the sun during the day; it serves to our internal clock to scan the various phases of the day, therefore prolonged exposure to a light source with fixed spectrum can cause various disturbances: in particular, exposure continues to a light tending to blue throughout the day to 5 days a week may cause disturbances in the production of melatonin, which, as a result, can lead to insomnia or difficulty falling asleep. The correct exposure, however, provides a cold light tending to blue in the morning, while approaching in the evening this should veer more and more towards a warm light, until you get almost to yellow. With our system we can simulate this change of tone during the day and keep our internal biological clock healthy. ​The SunLight System is an innovative dynamic white LED system that allows you to dynamically reproduce the spectrum of sunlight at any time of day. It basically consists of two parts, one or more LED boards and a bluetooth control board. 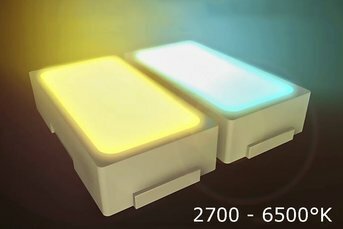 The LED board is the heart of our system, and is, composed of two alternating rows of independent LEDs on which LED 2700 ° K and 6500 ° K are mounted and can be indipendently controlled. By mixing these two rows of LEDs in percentage, through the specially developed controller, we are able to obtain a faithful reproduction of the light spectrum of the sun at any time of the day. Auto: allows you to synchronize the time of day and always have the correct light automatically. In this mode, if we turn on our light in the morning, we will have a light 6500 ° K tending to blue to wake up our body; if instead we turn on our light in the evening we will have a light 2700 ° K tending to yellow that instead has the function of stimulating the production of melatonin and relax our body. Obviously this change happens gradually throughout the day and in an absolutely imperceptible way for the human eye. It will also be possible to adjust the light intensity of the lamp throughout the day. Manual: in this mode it is possible to choose the desired shade and luminous intensity of the lamp that will remain fixed during the day. Program: the lamp can be switched on and off at a fixed time and with the intensity and the preset hue that will remain fixed. ​Before the advent of modern technologies, the human body based its metabolism on the change of light during the day. Basically, in the morning, the blue light of dawn stimulates the awakening, while in the evening the yellow light of the sunset stimulates the production of melatonin: a hormone secreted by the pineal gland that allows the body to relax sufficiently to fall asleep, allowing to follow the natural circadian rhythm. With the advent of PC, TV, tablet, smarphone and traditional LED lights, however, our eyes are constantly subjected to a light tending to blue and this causes our metabolism to stop, or produce in less quantity, melatonin thus compromising the regular functioning of our metabolism and, in many cases, forcing us to insomnia. 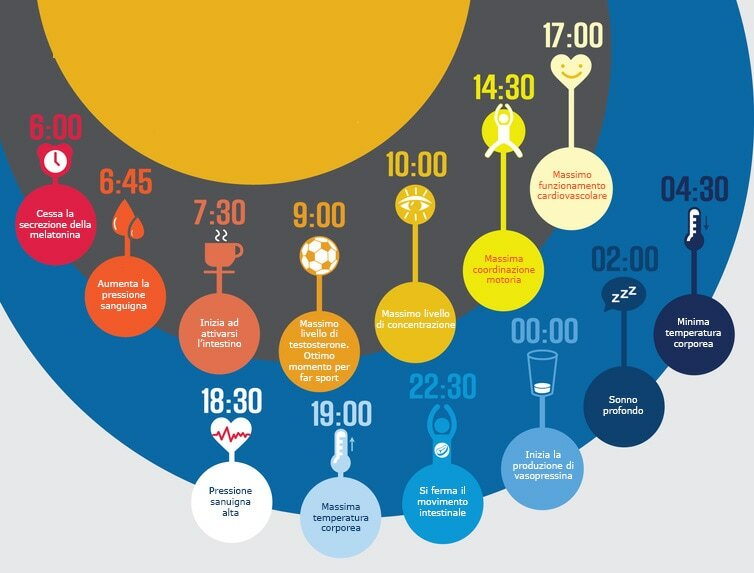 This is why the SunLight System becomes today more than ever a lighting system that protects the health of those who use it, allowing proper exposure to blue and yellow light during the day, stimulating the production of melatonin and making you sleep deep! ​The SunLight System can be integrated into any ceiling or luminaire, so it is aimed at designers, architects and lighting manufacturers who are particularly attentive to innovation. Obviously, the shapes and dimensions of the LED circuit can be adapted to the various projects and to the shapes of the ceiling lights. At the same time, together with architects and designers who already collaborate with us, we have produced a series of design lamps that exploit our system.